I’m Victoria Jackson and I am a Gleek! Ey Victoria! If you haven’t been overcome by the recent influx of showtunes and excellent acting of Glee then you should catch up fast! Glee is an American television series that has taken over the world and one of the main actresses, Amber Riley, who plays Mercerdes Jones, has a voice to die for. She’s a younger Aretha Franklin and has is a positve female role model for the shows audience. Amber is not stick thin like the rest of the cast but looks great throughout the show. 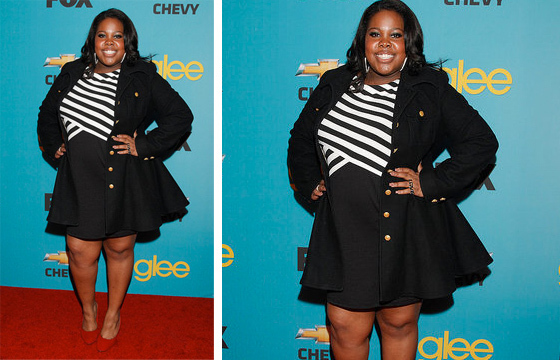 Here she is at a recent Glee party in Hollywood, looking gorgeous in a fitted A-line jacket and nautical style striped dress. How good do her red shoes look? Beth Ditto, songstress of the super group The Gossip, showed her fashion credentials by showing up to Paris Fashion Week. The singer was on the front row of Karl Lagerfelds runway show and sat with Nancy Shevell on the front row of British designer, Stella McCartney. For Lagerfelds show, Beth wore a gorgeous black number with a black studded, metal chocker and eye makeup to scare young children. For the McCartney show Beth was a vision in turquoise with a stunning statement necklace. The only thing I’d change about this outfit is maybe some better supporting underwear. If Gok Wan saw those bangers Beth, he’d have a fit. I’d suggest maybe wearing a corset such as this one from www.truecorset.co.uk to create some kiler curves. The website features corsets from size 8 right up to a size 30. 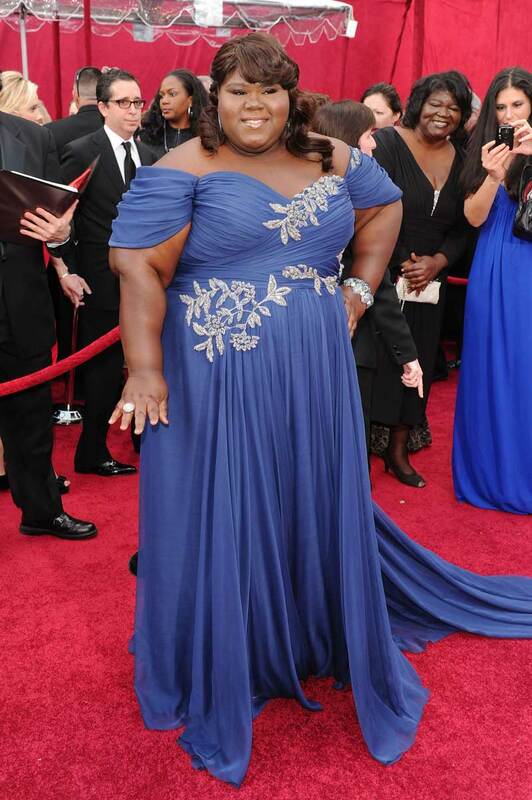 How gorgeous does Precious star Gabourey Sidibe look at yesterdays Oscar awards? I cant get enough of the blue colouring with her skin tone and the embellished neckline. It shows her curves off to perfection. Sadly, Sidinble lost out to Sandra Bullock (a deserving winner however) but she managed to look flawless on the night. She seems to have a passion for blue, the last three dresses I’ve seen her in have been that colour. But when you work it as well as this then who can blame the girl? As for the presenter on the AP network who said best actress nominee Gabourey Sidibe would “have to have her dress specially made” and how “hard it is for people like her”, he will come back in his next life as a dung beetle. 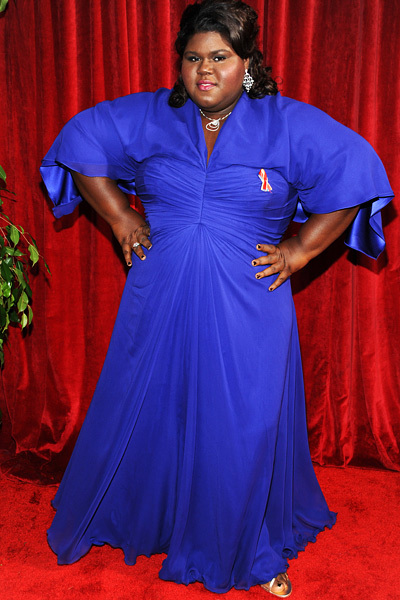 And for the record, Sidibe looked completely gorgeous in her blue dress. A simple, sophisticated beauty. Queen Lafita rocked the award ceremony in a gorgeous pink, satin floor-length gown. The 39-year-old singer and actress was a presenter at the Academy Awards. She introduced a clip for the Governor’s Award ceremony that honored achievements, exceptional contributions to Motion Picture Arts and Sciences, and outstanding service to the Academy. For Gabourey Sidibe her first Oscars are all about a paior of real characters – Steve Martin and Alec Baldwin. The “Precious” actress and Best Actress nominee revealed she is most looking forward to meeting and seeing the hosts for the 82nd Academy Awards. “I was really excited that show would be hosted by Jack Donaghy and the Jerk,” the actress said referring to the duo’s most famous roles. We couldn’t agree with her more. Standing between the two massive Oscars at the press podium of the nominee luncheon on Monday, Sidibe said it was all starting to feel real. Indeed the luncheon is one of the true signs that the Oscars are right around the corner. “It feels like we’re finally here,” she said. Sidibe is seen here in a gorgeous pink satin dress and black bolero. The name of everyones lips at the moment is actress Gabourey Sidibe, who stars in the years hottest film, Precious. In 1987, obese, illiterate, black 16-year-old Claireece Precious Jones (referred to by her middle name) lives in the New York City neighborhood of Harlem with her dysfunctional mother, Mary. She has been impregnated twice by her father, Carl, and suffers long term physical, mental and sexual abuse from her unemployed mother. The family resides in a Section 8 tenement and subsists on welfare. Her first child, known only as “Mongo” (short for “Mongoloid”), has Down syndrome and is being cared for by Precious’s grandmother. The film is based on the 1996 book, Sapphire. I’ve posted the fabuous outfit Gabourey wore to this year SAG awards, a floor length electric purple gown that looked fabulous against her skin tone and complimented her figure perfectly. 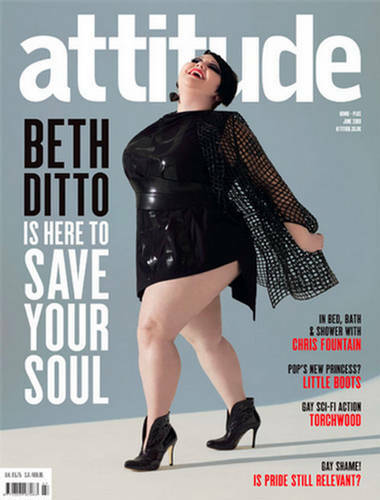 As you all know I’m a massive fan of Beth Ditto. Shes unashamedably flamboyant about her fabulous figure. Ive added thse magazine covers because it shows how, even though thin may be in, Beth has that charasima that gets her not only in the magazine but on the front cover! My favourite look has to be the front cover of LOVE magazine, showing all Beth’s curves in their pure beauty! I just realised that although, I’ve added a top ten of plus size American celebs, there was no mention of any home grown icons. So Ive complilled my own for you here. They span from singers, to comedians to chefs, take your pick and choose your favourite.